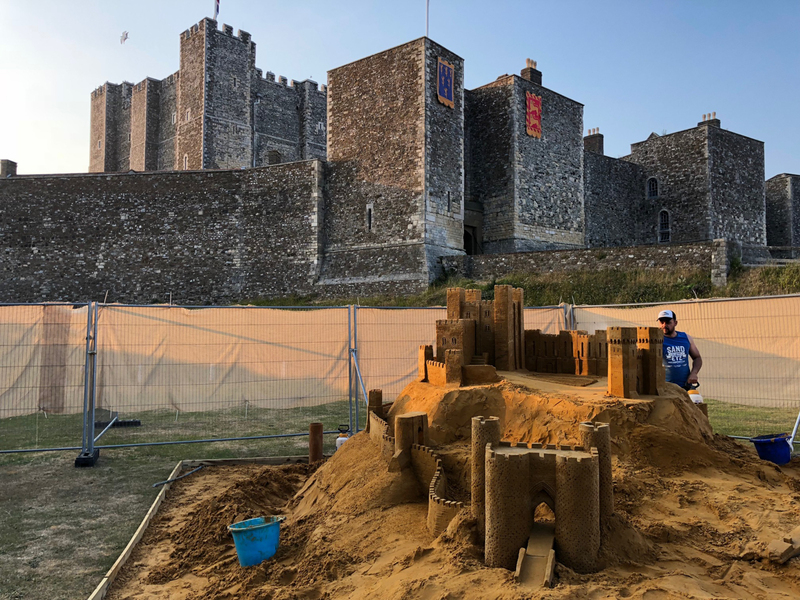 This will be accompanied by ‘Sculpting Through History’ sand sculpture engagement workshops run by Sand In Your Eye and open to the public at 8 castles around the country, where families will be able to spend 45 minutes sculpting the evolution of the castle using…a sand castle! 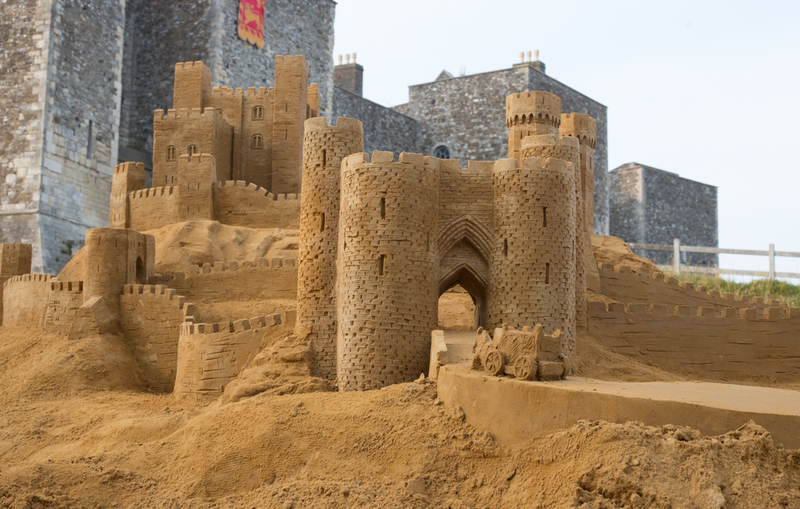 There is also a competition throughout England to build the best sand castle. 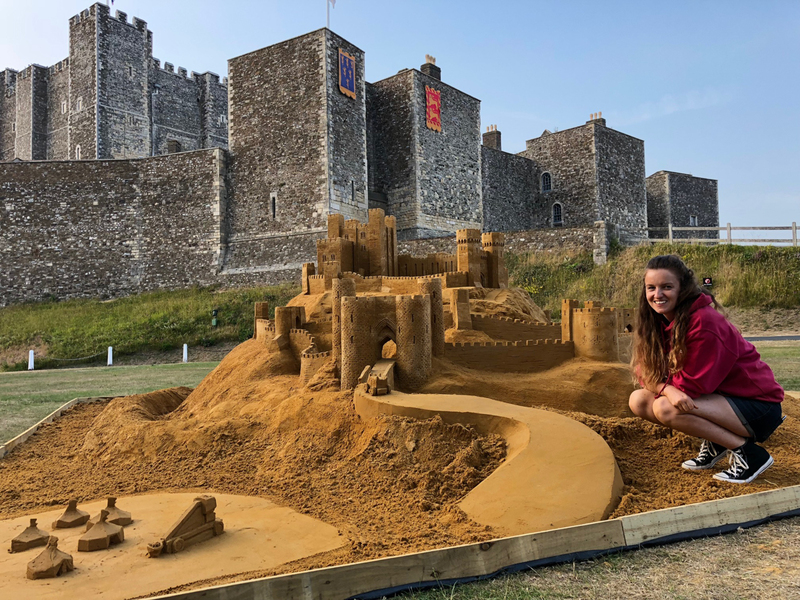 To be in with a chance with your own castle, stick an English Heritage flag in it, take a photo and upload it to the English Heritage website, Instagram or Facebook pages with the hashtag #LoveCastles and you could win a holiday in an English Heritage holiday cottage. 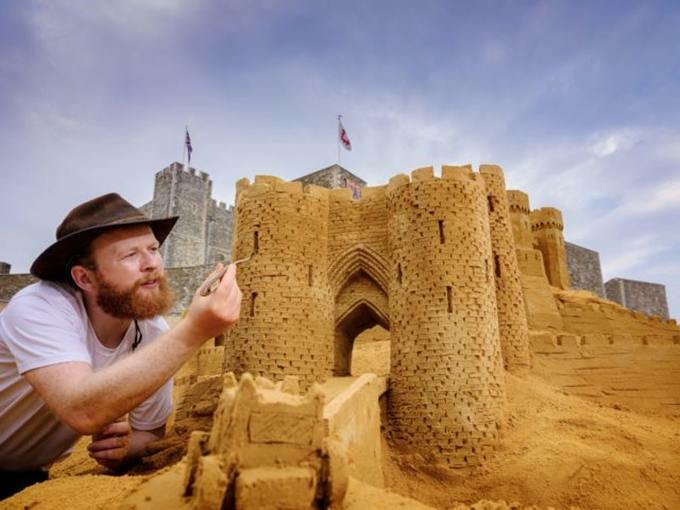 Get some top sand castle tips from Sand In Your Eye’s Jamie in this video. 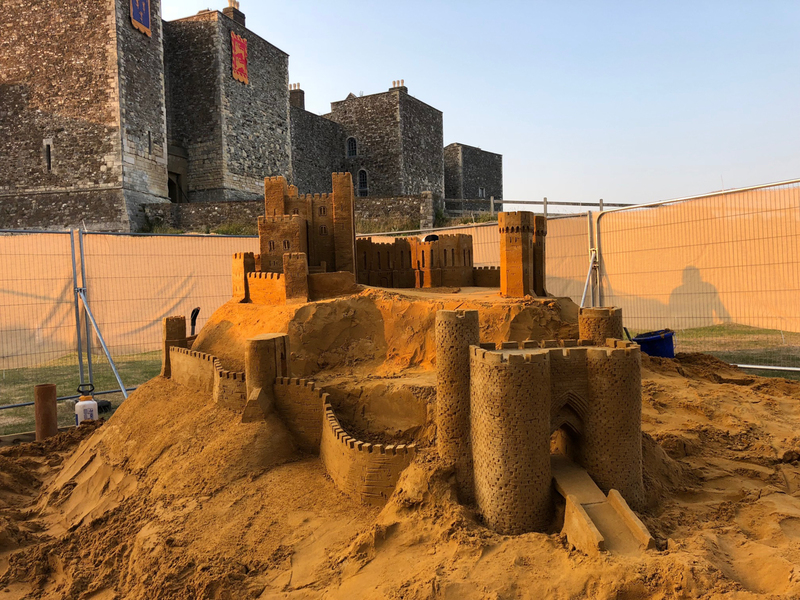 The sand carving was a great press success and was featured on Radio 4, BBC Breakfast, ITV News and in several newspaper articles such as the Guardian. 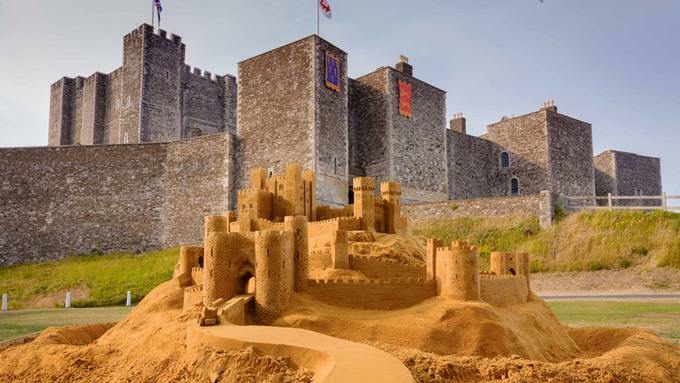 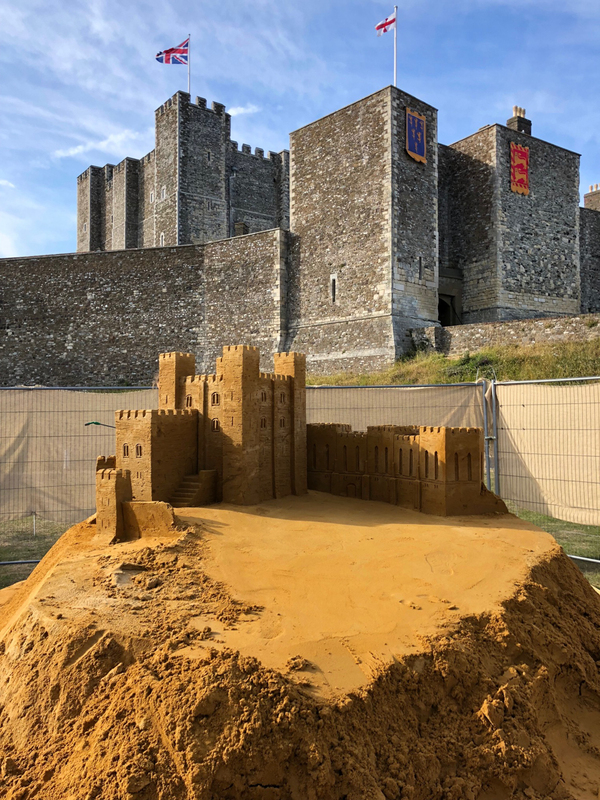 The Sand In Your Eye team of Jamie Wardley, Claire Jamieson and Rodrigo spent 5 days at Dover castle carving a giant castle designed by Roy Porter, one of the lead curators at English Heritage. 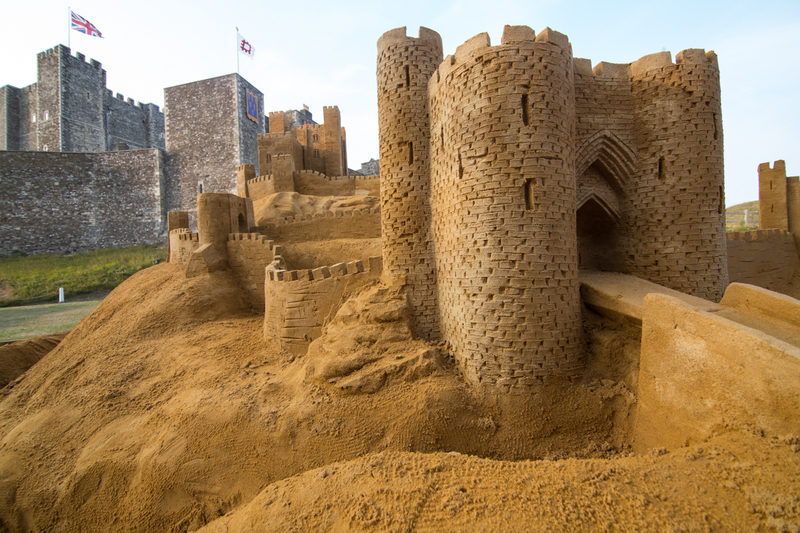 Roy took elements from all the best castles in England, putting them together into one enormous structure that in his view would make the ultimate castle. 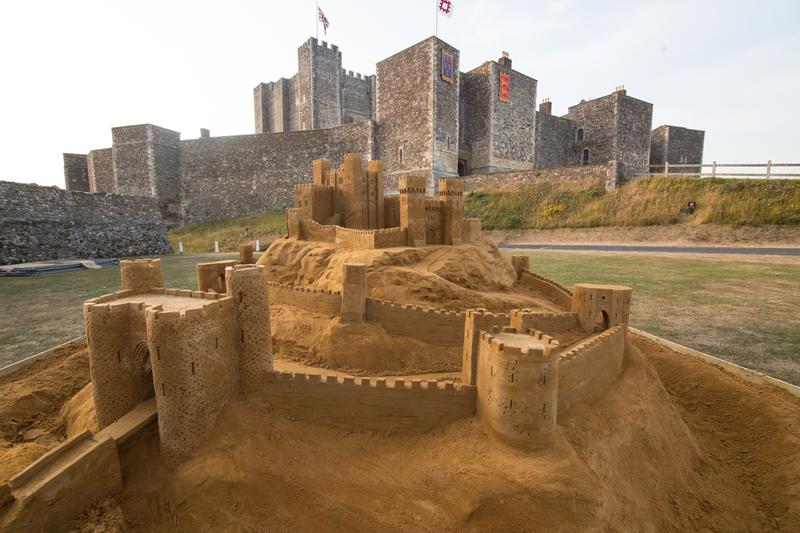 Roy would often come to oversee the progress of his hard work and was overjoyed to see it all come together. 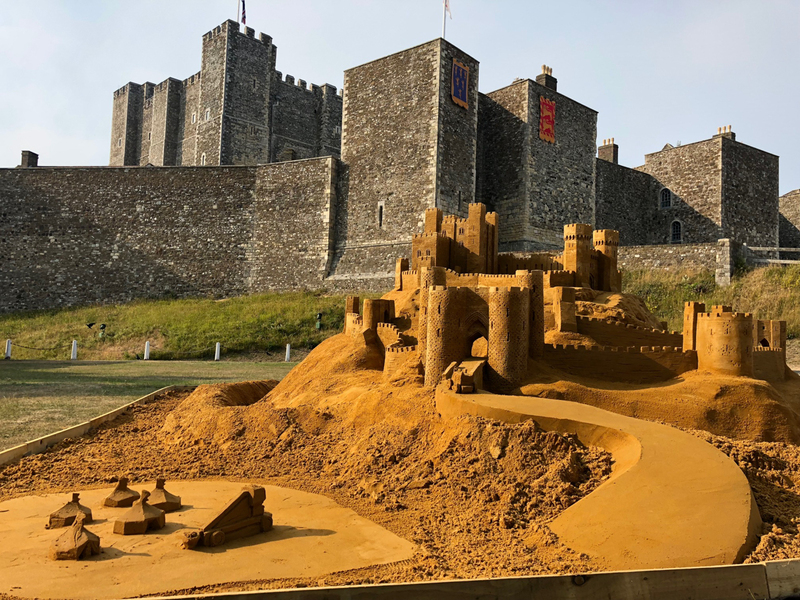 The medieval castle of Dover is perfectly designed as a defensive fortress and as well as being able to repel invaders it proved a challenge to the team and the articulated lorries we usually get to deliver the 29 tonnes of sand it would take to build the sculpture. 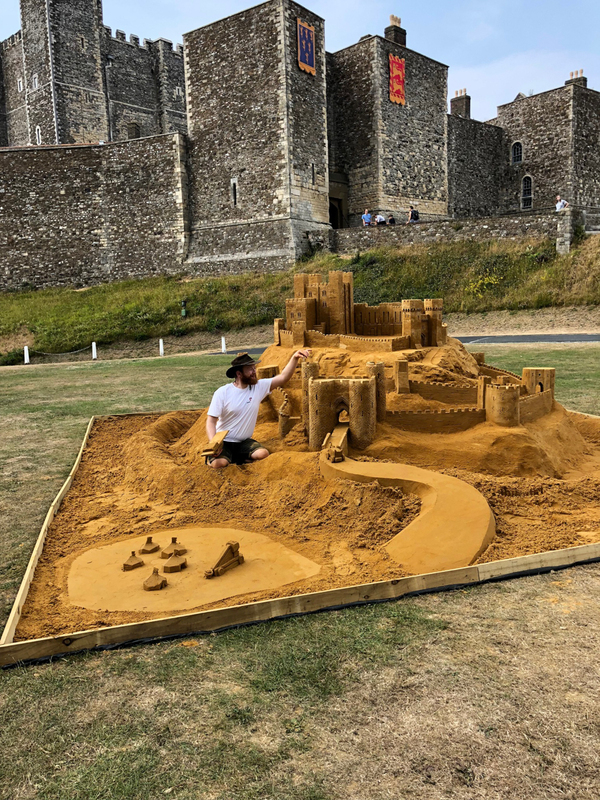 Luckily for us, some friendly local farmers, Simon and Alex helped by using their tractor to get the sand into place. 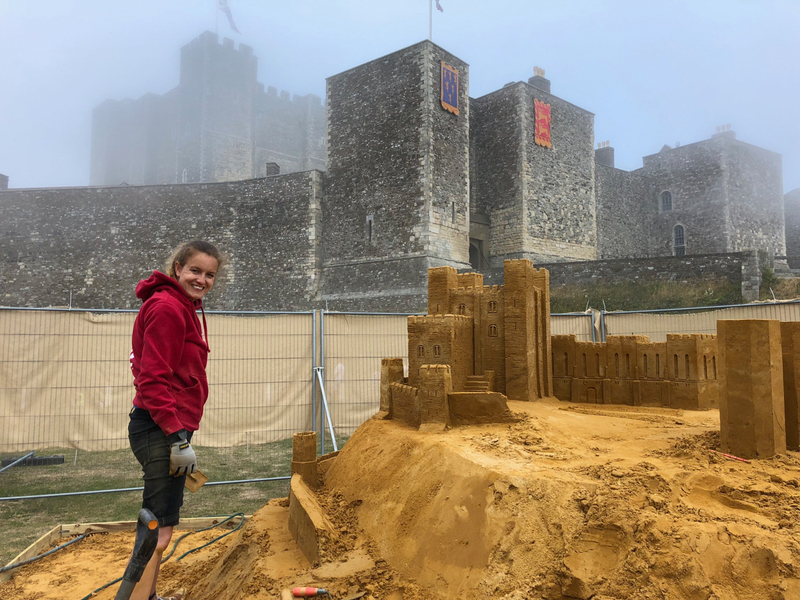 The first day we compacted the sand and built a sand pit to neatly contain the sculpture for the rest of summer 2018. 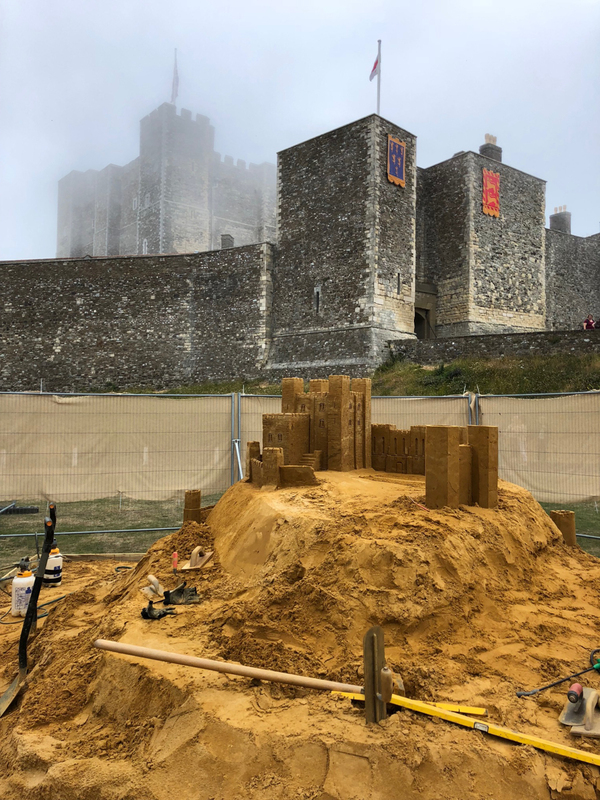 The giant sand castle was carved over the next four days, through blistering sunshine, wind and the occasional sea fog with the ships approaching Dover harbour hauntingly tooting their fog horns. 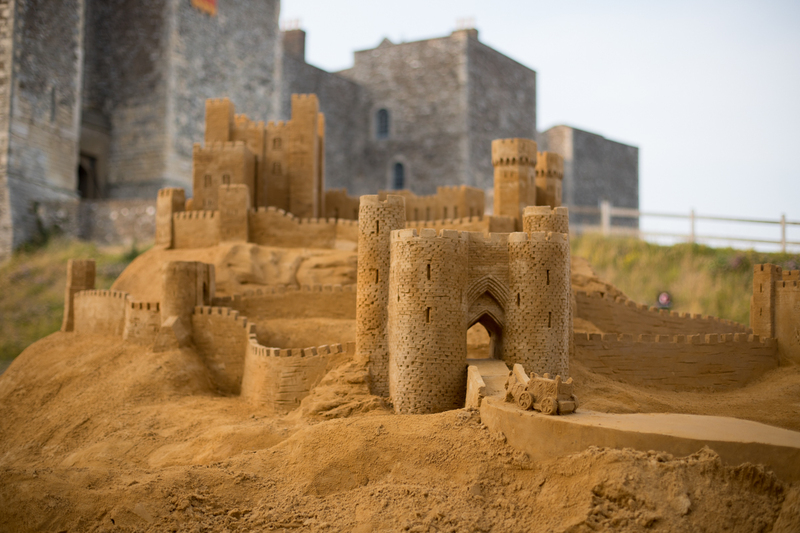 Jamie, Claire and Rodrego loved working surrounded by such spectacular scenery, heritage and culture. 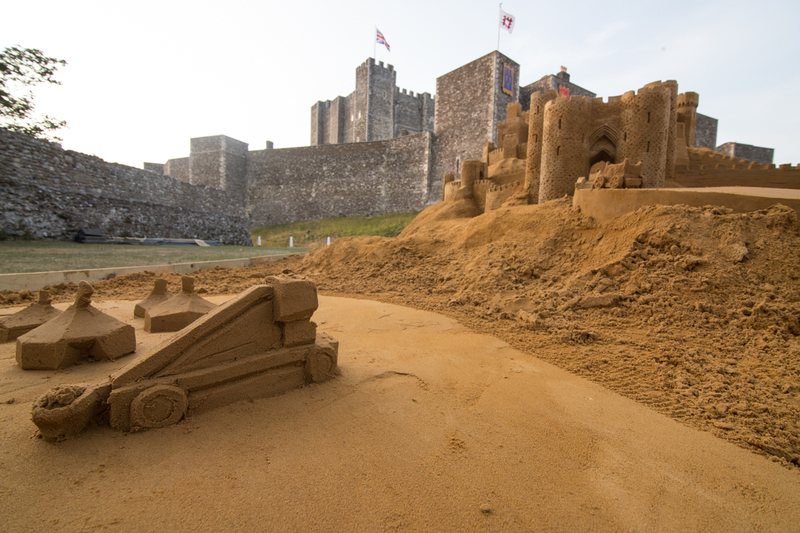 It also has great ice cream which was much appreciated on a hot day! 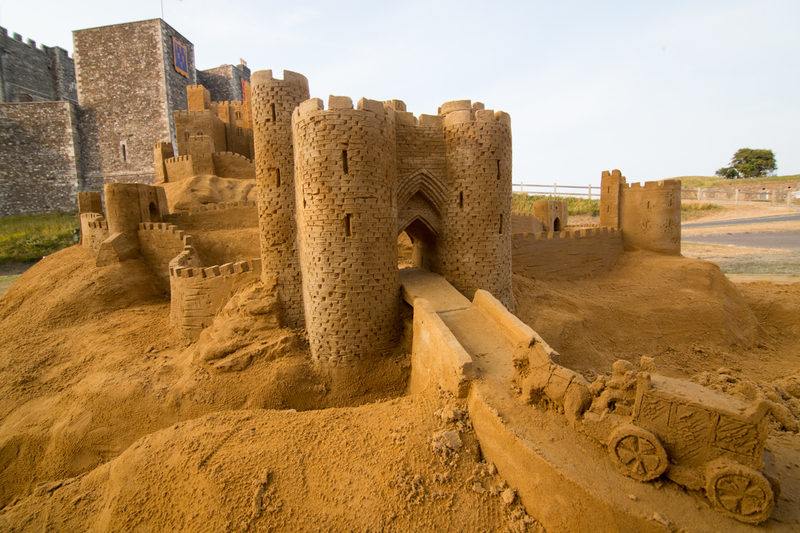 The staff were always very friendly and happy to tell us about the castles history and architecture. 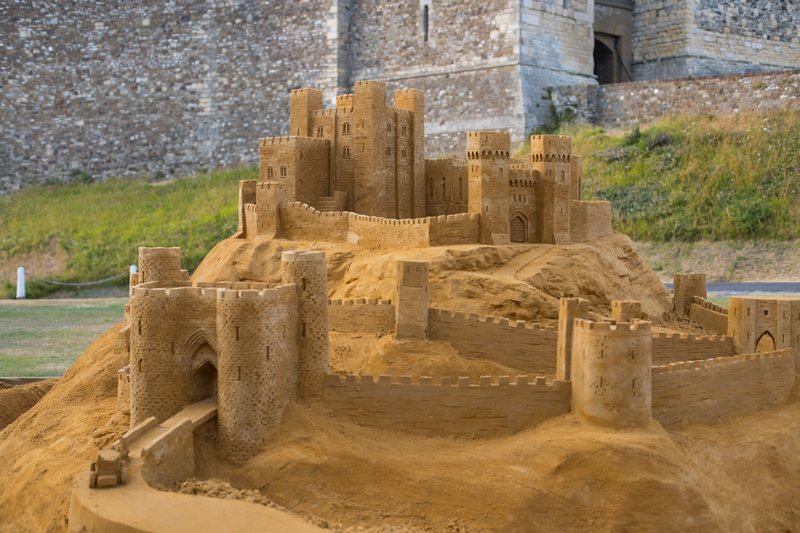 Castles are structures that evolved over centuries, and this can be seen in the buildings present and in the forthcoming workshops. 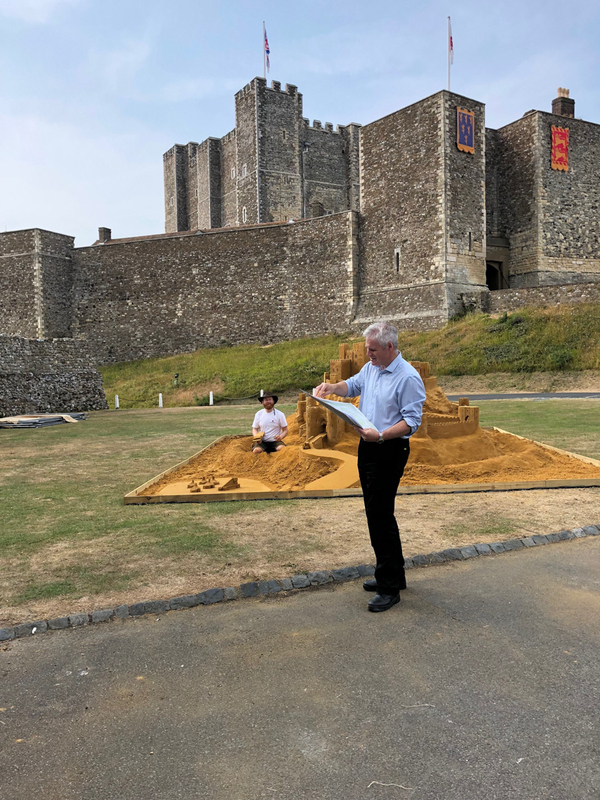 Thanks to everyone at Dover castle, Roy Porter, Farmer Simon and Farmer Alex, and especially Isobel Cooley from English Heritage Press Office, who was a great help and couldn’t do more to make sure things ran smoothly. 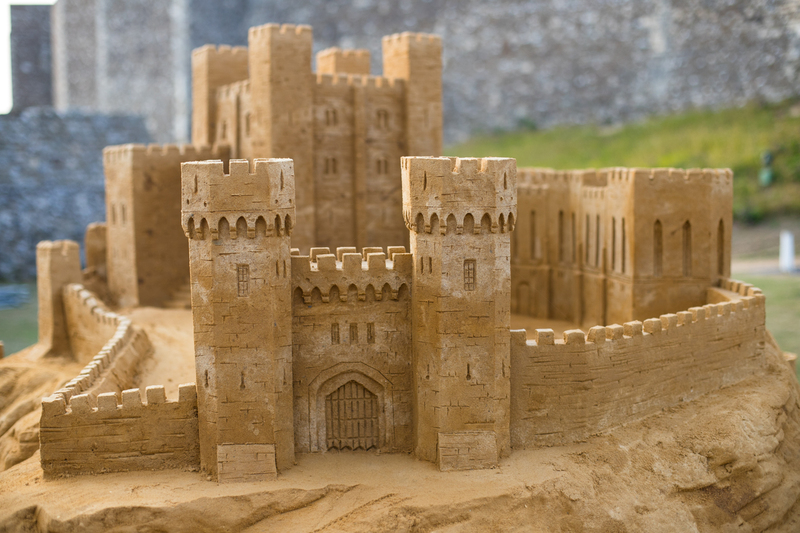 Will our sand sculpting stand up to attack from the sand trebuchet? 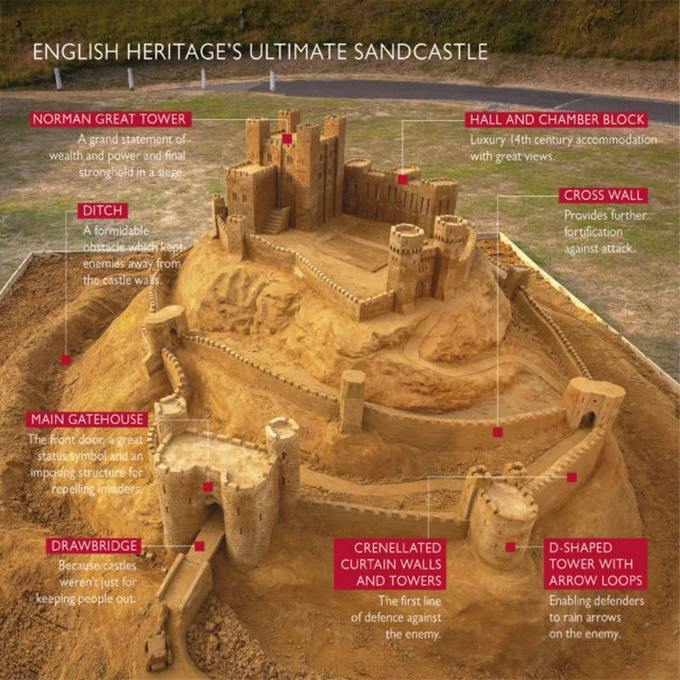 Based on medieval castle construction, this sand sculpture for English Heritage is the ultimate sand castle!